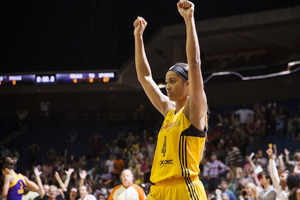 TULSA, OK—The Tulsa Shock (9-17) returned home on Sunday afternoon to take on the Chicago Sky (10-16). They had suffered through a pair of losses on the road in the last week in San Antonio and Washington coming off the WNBA All Star break, and they were anxious to get back on the winning track in front of the home crowd in the BOK Center. 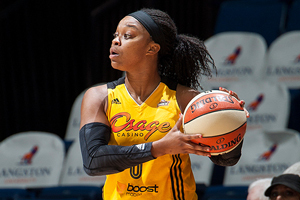 The heroine for the home team was rookie forward Odyssey Sims, who turned in a 24-point performance with six rebounds and eight assists. Skylar Diggins was a close second with 18 points, (her 24th time scoring in double figures in 25 games), and Glory Johnson bringing up the rear on her birthday putting in 15 points and eleven boards, her fourteenth double-double of the 2014 season . The ten-point win over the Sky came after a game where the Shock got down a number of points, trailed by seven at the half and used good hustle and a solid attack to steal the game away from the visitors in the final two quarters led by the efforts of the newly crowned Big 12 Player of the Year Odyssey Sims. Sims managed to take a slow start by her team in the first half and manage to turn it into a win. Sunday’s win elevated the Shock to 9-17 on the year, three games out of the final playoff spot in the WNBA Western Division. They have a series of three more home games against Seattle, Atlanta and Minnesota and wins in those games are key if Tulsa is to secure a playoff spot for the first time since the move from Michigan five seasons ago. The next game for the Shock is this Tuesday night when they take on the Seattle Storm at 7pm in the BOK Center. Tickets for that game and the remaining three home games of the 2014 Shock season are available at the BOK Center box office. This entry was posted in Sports on July 29, 2014 by admin.